Operating Instructions by Anne Lamott landed in my lap, so to speak, at the perfect time. A woman in my new mom’s group recommended it and I ordered it immediately, having read Bird by Bird, Lamott’s wonderful guide to the writing process. I have been feeling the winter blues (yes, in Vermont late March is definitely still winter!) and feeling the heaviness and the struggle of caring for a baby and the postpartum experience, which is very much still a reality even ten months in. Lamott honors the heaviness and the struggle, but juxtaposes it with the lightness and joy and covers everything in between. I needed this book to validate the humanness of this ever-shifting journey. Also, it has to be a testament to the quality of Lamott’s writing that I have nearly finished the book in 36 hours, despite the time demands of caring for a little one. Too much of what we are exposed to as new mothers are polished, filtered (hello, Instagram!) portrayals of new motherhood. And no, I will never stop talking about how damaging and harmful this is for raw and struggling new mamas. Our capitalist culture is so attracted to whatever is sparkly and well-marketed. This includes images and accounts of motherhood, and what it looks like and feels like to raise a child. Sure, there are moments of unbelievable light and beauty. But there are often also moments of unbearable challenges that strike to the very core of who we are and make us question everything we thought we knew about ourselves. 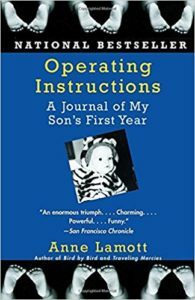 Lamott doesn’t shy away from this piece of the puzzle, and in fact bravely shines a light into the dark corners of herself, using radical honesty and self-disclosure as both a literary device and tool for healing, empowerment and connection. Much like Brene Brown does in her writing and talks, Lamott proves that shame can only survive in the shadows, and that there is a certain liberation and freedom in showing our darkness to one another. Writing about those moments of motherhood that are not saintly, holy, or even pretty takes courage. It takes a willingness to be truly seen and that level of vulnerability isn’t easy to come by. Lamott’s faith, as well as her history with addiction (both of which she shares about extensively in the book) have clearly given her some tools of self-inquiry and self awareness. These are gifts to the reader, as she uses them not to put herself on a pedestal, but to put herself right there “in the muck” with the rest of us. I have read many parenting books that have made me feel like a fraud and a failure. Books that say things like, you should basically never put a baby down. Or, breastfeeding is the only truly good way to feed a baby. I’m exaggerating, of course, but not by much. There is a lot out there that can sneak up on us on days we’re feeling like less than our best selves (so, most days) and create opportunities for extreme judgment and doubt. What I love about Lamott’s writing is that she gives voice to the judgment and doubt. She names them and makes friends with them, so that she can release them. I think what I love most about her writing, though, is her ability to capture the miracles in the tiny moments of care and love that characterize the experience of raising a child in community, however that looks for someone. How many loving people and tiny acts of kindness it takes to care for and raise a baby. She so gorgeously and effortlessly shares these moments with her readers in a way that allows us to reflect on and more fully appreciate our own versions of those moments of tenderness and care. One of my favorite of these anecdotes in the book is when Lamott describes an older man from her church asking her what one thing she would ask someone for if she had no fear of shame or embarrassment. When she answers that it would be asking someone to clean her bathroom, this man proceeds to spend an hour scrubbing down her bathroom for her. Lamott writes, “It made me feel sure of Christ again, of that kind of love. This, a man scrubbing a new mother’s bathtub, is what Jesus means to me”. Even if someone doesn’t relate to the Jesus part, I think any new mother relates to how small acts of care are actually miracles. And how important it is to stay open and receptive to the miracles, even and especially in the tedium, monotony and downright struggle of raising little ones.